I used to brag on here that M was an adventurous eater. She would eat bits of whatever we were having at meal time and she would woof it up all by herself. I felt sorry for those parents who were making chicken fingers and PB&Js all the time for their picky eaters, as I was whipping up a roasted beet salad for M. I should have known that my kid would be just like every other 2 year old out there - a picky eater.Now I am lucky if she eats 1/100 of what is on her plate. Doesn't matter whether it is chicken fingers, or grilled pork...the kid hardly ever eats. She will have one or two days a week where she eats non-stop, and then the other 5 days she eats like a freaking bird. No matter what I make she will pick at it for a few minutes and then tell me "all done. I want to go play." 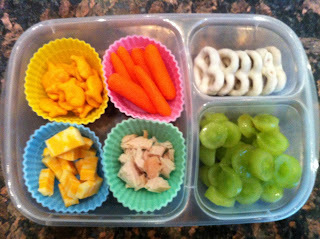 When it came time to pack her lunch for camp this summer, and now pre-school, I was terribly nervous about what to put in her lunch box. She would be away from home for 4 hours, and wouldn't be able to ask for 100 different things like she does at home (all of which she has one bite of of course.) What if she hated what I sent for a snack and was starving? And then hated what I packed her for lunch and threw a fit? This gave me more anxiety than actually dropping her off at school! 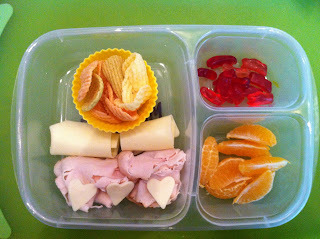 So I did research, as I have mentioned here on the blog (see this post and follow me on pinterest as I have a board about toddler food ideas), and decided to go the route of the Bento box lunch - lots of little compartments for lots of little snacks, instead of the traditional sandwich-and-sides lunch route. Here are some of her lunches from last week! Wow! Impressive! Where did you find the containers and holders? Yes, would love more info about the container and are those silicone cupcake holders?